Slovenia borders the Adriatic Sea, but it has only a very short coastline, not more than 47km. So you could imagine that if all Slovenians ànd all sun-sea-beach-loving tourists are planning a day at the coast on the same time, the beaches would be packed with sunbathers, badminton players, and sandcastles. Not really our thing. Don’t get me wrong here: we do like the beach, Febe loves to play in the sand and we definitely are snorkeling enthousiasts. We just don’t like crowds. That day during our holiday in Slovenia in August of 2015, we had planned to go to the coast. It would become a very hot day (36°, real feel 40° our thermometer informed us), and the beaches of Slovenia were, simply, full. 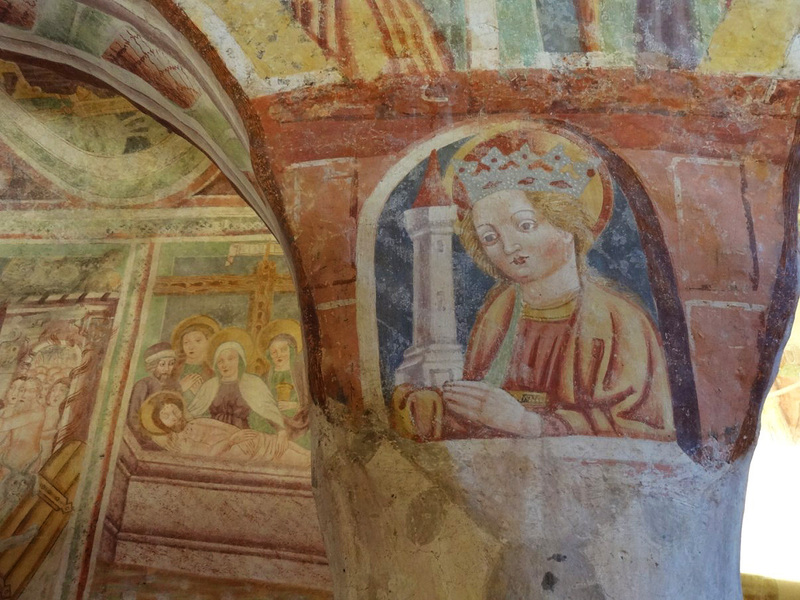 Fortunately, we had started that day with a highly recommendable visit to the marvelous Romanesque Church of the Holy Trinity in Hrastovlje, with its jaw-dropping interior, completely covered in 15th-century frescoes. 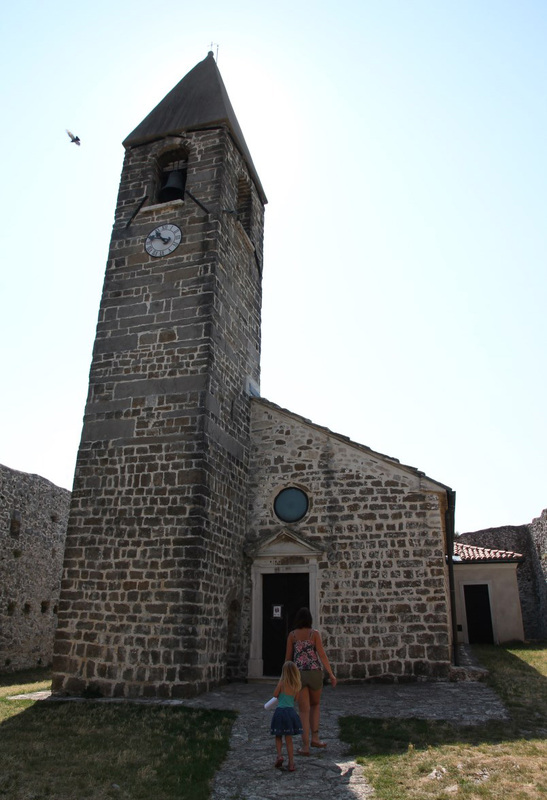 The Church of The Holy Trinity in Hrastovlje. In order to reach the church you have to follow a winding road uphill. The location of the church is well-indicated along the road. There’s a small parking lot close to te church. 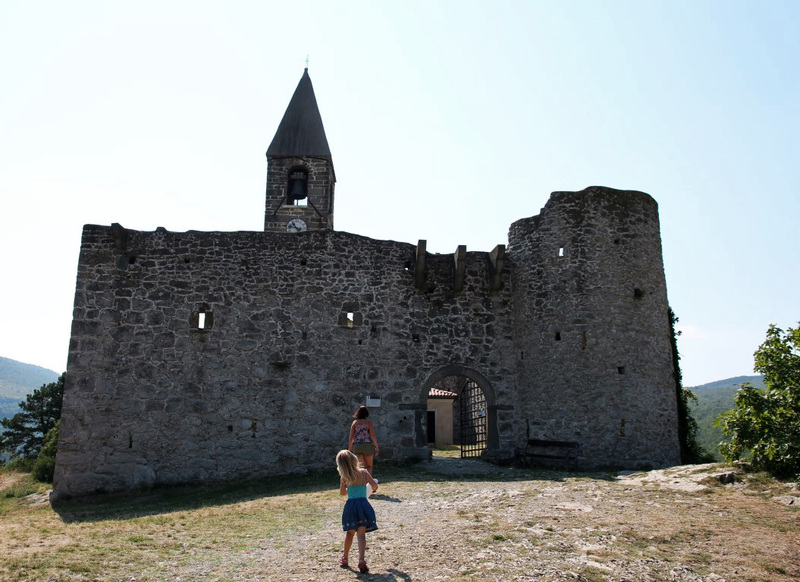 The first thing we noticed when approaching the church was that it is surrounded by fortified walls, which is rather strange for a church. In fact, these walls were used to protect the chuch against the Ottomans, who invaded this territory in the the 16th century. The church, inside the walls. The interior of this church is breathtaking. 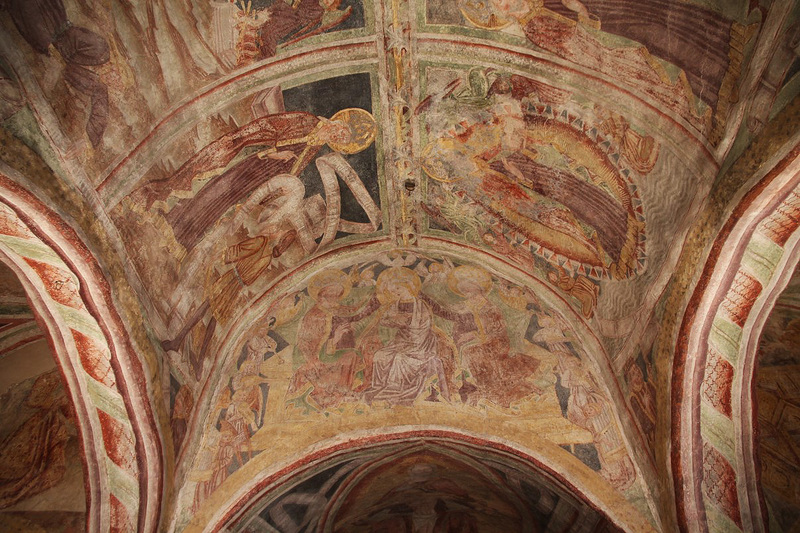 All walls and ceilings are decorated with narrative frescoes, painted by Johannes de Castuo at the end of the 15th century. 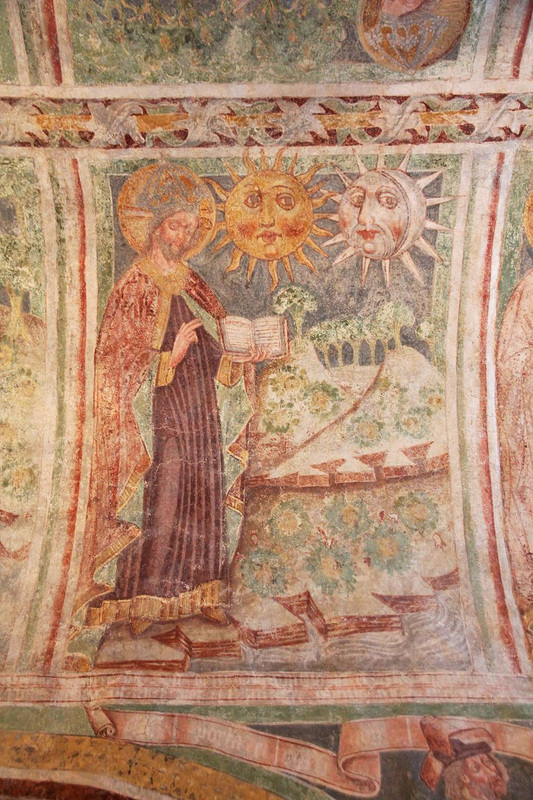 These paintings were used as a bible for the illiterate parishioners. Genesis: God creates the sun and the moon. 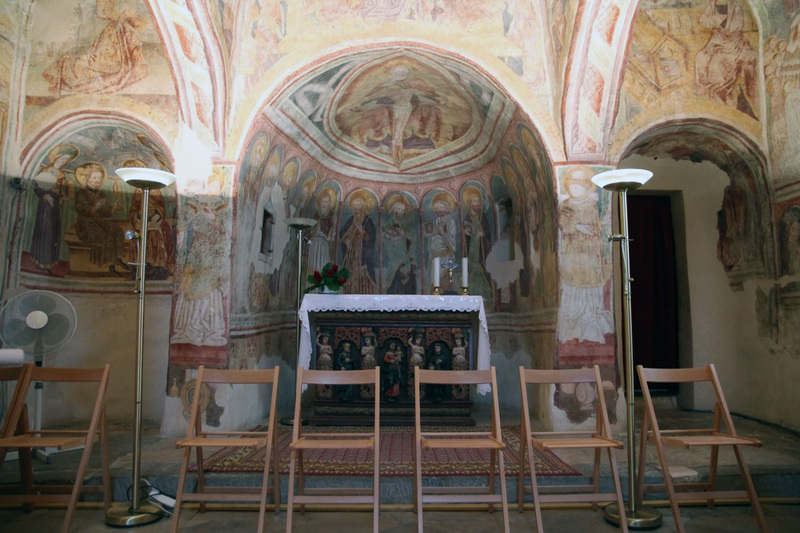 Even the pillars are decorated with frescoes. This concept of a wall-filling comic avant-la-lettre, telling biblical stories to the common people, was a popular one in those days. We saw other examples elsewhere, e.g. in the Sainte-Chapelle in Paris and in a couple of churches on the Danish island of Møn. 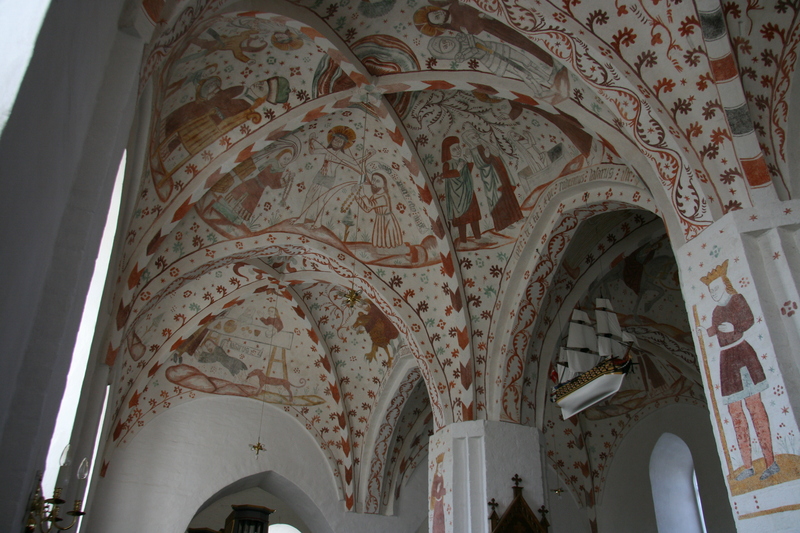 Frescoes in Fanefjord church on Møn (Denmark). 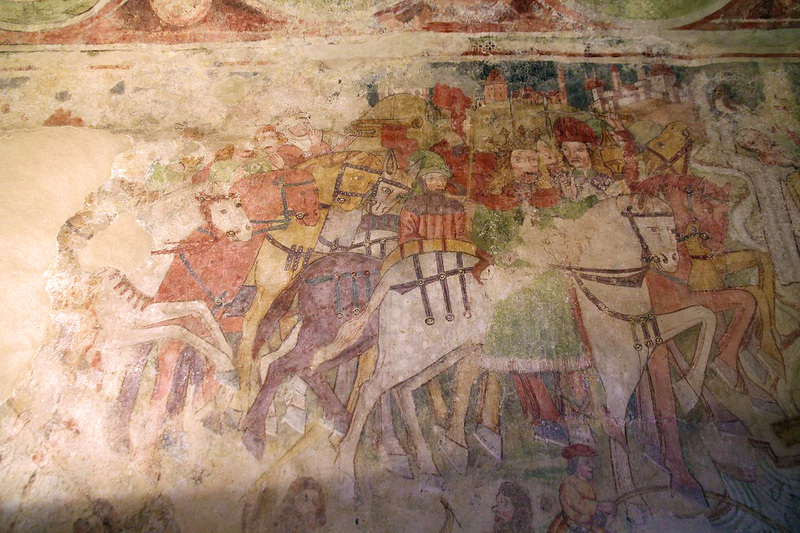 The most famous of these frescoes is the so-called Dance of Death. 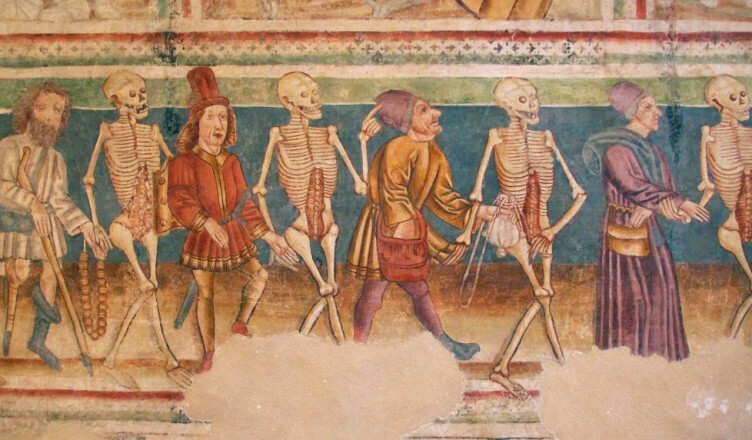 It depicts a long line of people from different professions and diverse social classes, accompanied to their grave by an elated group of grinning skeletons. The message here is as obvious as it is sobering: everyone is equal in the eyes of God, regardless of your wealth or importance in life. The Dance of Death reminded me of a fresco we once saw in the Etruscan necropole of Tarquinia (Italy). 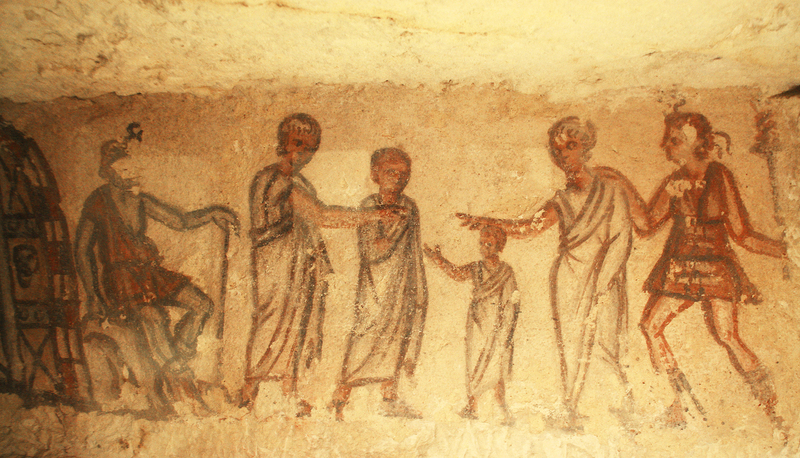 It shows a small child and an Etruscan demon of death leading the deceased towards the gate of Hades, God of the Underworld. 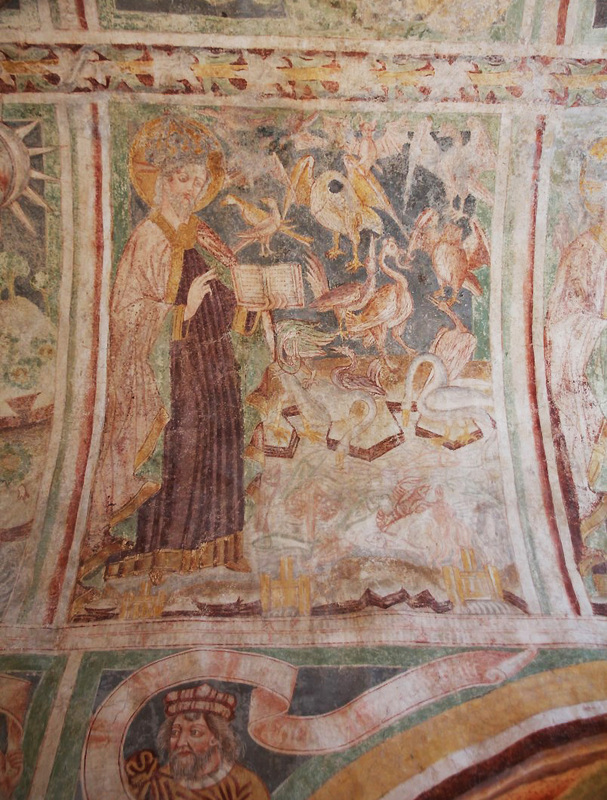 Death scene, Tomba 5636, Tarquinia. In the afternoon, the search for a suitable spot on the beach started. It wasn’t really succesful, as it was very crowded all over the coast. We ended up on a shaded lawn in the city of Portorož. It was close to the water, but there was no beach. 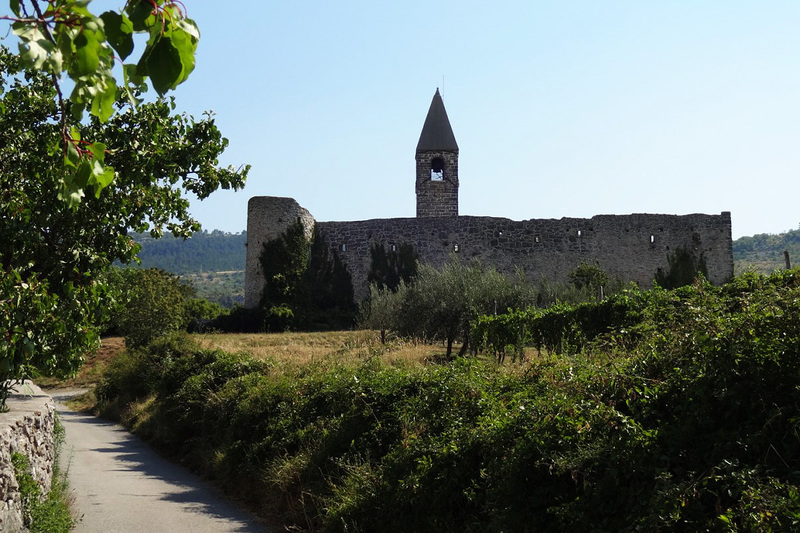 Eventually, we tried to go to Piran, but at a certain point the road towards the town was blocked. A sign indicated that the city was “full”, which meant that there was no parking space left there. There were shuttle buses though, but the parkings for those buses were full as well. So we drove on. 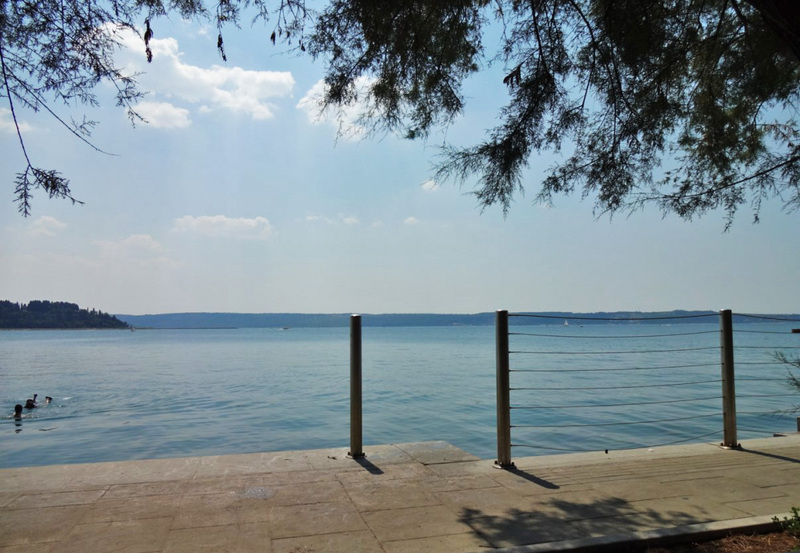 Later that day we ended up in the nearby town of Izola, where we enjoyed some refreshments and finally found a beach, which was completely packed with sunbathers, though. 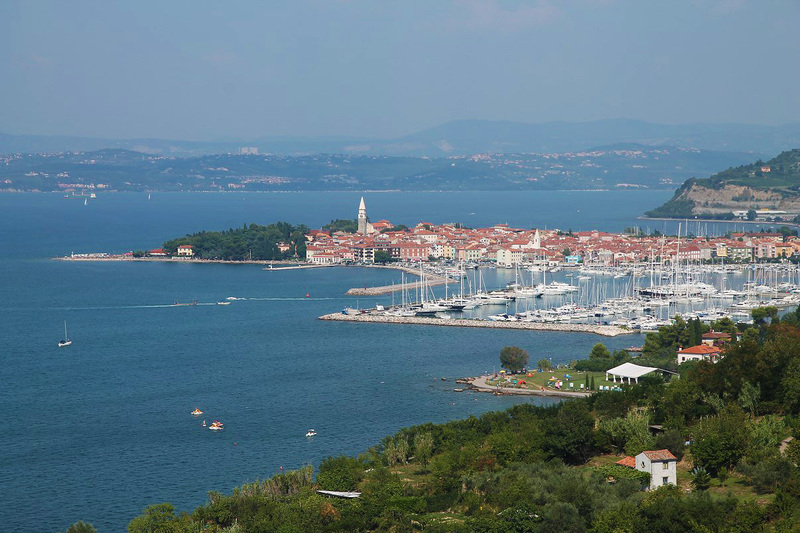 Nevertheless, it seemed a nice little town, typical for the Slovenian and Istrian coast. At the harbour of Izola.